James Tartaglia is Senior Lecturer in Philosophy at Keele University, a much-published author, a previous soloist winner of Young Jazz Musician of The Year (Daily Telegraph 1991); he has studied in the USA and this is his third album. Ms Radcliffe gives us word-rich rhyming lyrics about various philosophical ideas and Ms Morgenstern provides spoken word explanations of concepts, both performing to a modern, sometimes boppy jazz background which illustrates the ideas mentioned. For instance, the track named Teletransportation explains how your body can be scanned, destroyed, then conveyed to another place and reassembled. The music thrusts us along with lengthy improvisations on piano, sax then bass, lively lyrics, then a mock-posh voice to explain the concepts, more travelling music, and words about death given in a amusingly cheerful voice. In fact the whole album has many thoughts about being and non-being, with track titles including Animalism; Dream, Death and the Self; Email Persona; No-Self (Onion); Spicy Crab; Me For You and You For Me; The Transcendental Ego; Philosopher Blues. I hope I haven’t given the impression that the CD is pretentious as this is not the case and this is avoided by the use of humour, especially on Philosopher Blues, which lists various philosophers, such as Plato ‘get outta yer cave’ and Kant ‘when you gonna learn to smile’. Reviewing this album has probably happened at the wrong time for me, as I’m still joyful from hearing the Zhenya Strigalev band at the Globe last week, a wonderful performance of highly original jazz, which was perhaps more philosophical in its way than Continuum of Selves, as for me ZS questioned the very nature of music without a word being spoken. 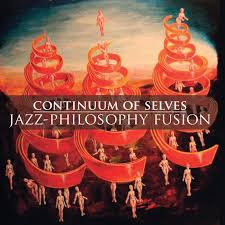 Nevertheless, Continuum of Selves is good jazz with very thoughtful words. 'former vinyl days...' it's never gone away!